Human vs. Digital Labor: Will The Results This Time Be Different? Since the industrial revolution in England in the 19th century, many policy makers and the public at large have been concerned about the effects of automation on jobs. For example in 1961, Time magazine published a provocative article entitled “The Automation Jobless,” which posited that efficient machines and productivity improvement would eliminate many low and semi-skilled jobs. 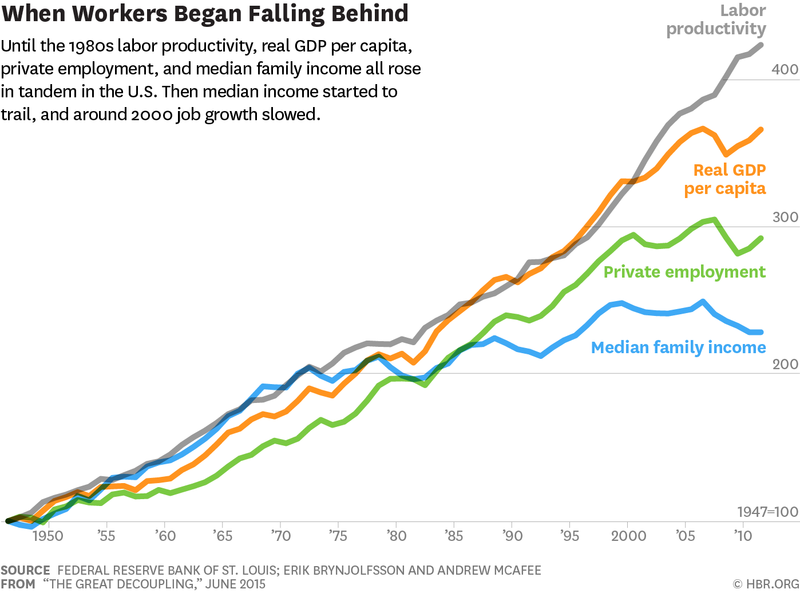 As the figure below illustrates, private employment paralleled the growth in labor productivity (in the US) until the turn of the century/ millennium. Is this time different? Has the age of technological unemployment arrived? In their first book on this topic, Race Against the Machine (RAM 2011), Erik Brynjolfsson & Andrew McAfee (B & M) argue that until the 1980s, as shown above, technological improvement and workers’ incomes grew together . In RAM, they opine we can again bring these two paths together; however, we must equip our labor force with skills to use these technological developments as we have done in the past. For a short version of 2MA, read “The Great Decoupling: An Interview with Erik Brynjolfsson and Andrew McAfee” in the Harvard Business Review (June 2015) or watch and listen to Andrew McAfee’s talk on 2MA. To read more about 2MA, go here.